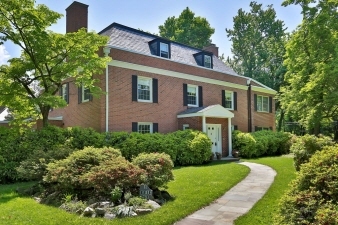 ruly Beautiful & Spacious brick Williamsburg Colonial situated on picturesque and tranquil half acre corner lot in Ardsley Park. Boasting New Slate Roof, all new windows, High Ceilings, Central A/C, 5 plus bedrooms, large family room, Dreamy Master Suite with Sitting Room & Walk in Closets 3 fireplaces, oak hardwood floors, 2 car garage and in-ground heated pool. Walk to Ardsley on Hudson Metro North train.